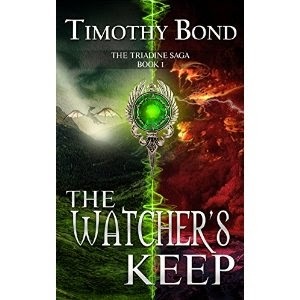 Timothy Bond's "The Watcher's Keep," book 1 in the Triadine series, is an epic fantasy that follows twins (a brother and sister) that are thrown into a conflict of epic proportions. The two main characters, Peter and Alex, two young kids with a thirst for adventure and knowledge leave their sheltered lives behind and go on a mission to recover pieces of the Triadine to unite everyone against the growing threat of the Dark Wizard. One of the highlights of this book for me is the world-building. Bond creates a rich world with extensive back stories for all the different factions involved. I was reminded a bit of the LOTR series as I read. I also loved the cast of characters, my favorite being the witty, strong-willed Lynntania, although Peter is close behind. If you're looking for a new epic fantasy with a fascinating world and engaging plot, look no further than "The Watcher's Keep."